This pasta is so delicious and beyond easy. It is the perfect example of how you can reinvent leftovers into something brand new. I find that having a homemade sauce or dressing on hand helps me create healthy, flavorful meals in a snap. It is also a great reason to always grill extra chicken, flank steak, or almost any protein. Although I typically use whole wheat or brown rice pasta, I often keep an 8-ounce package of fresh pasta on hand for a speedy meal. 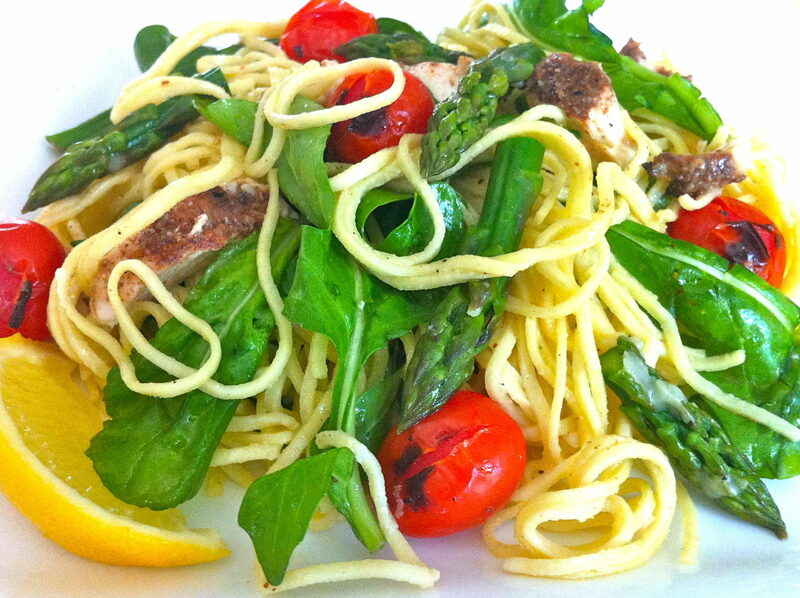 The angel hair variety I use cooks in one minute and the light, fresh flavor pairs well with this sauce. You may use whichever pasta you prefer. Cooked quinoa or couscous work well, too. While I used leftover Spice-Rubbed Chicken and Everything Sauce, you could use rotisserie chicken and Better-for-You Ranch or even leftover flank steak and Greeked-Out Gorgonzola. The possibilities are really endless and, although I have noted a few substitutions, let your imagination, your taste buds, and your veggie drawer be your guide. Cut chicken across the grain into strips or bite-size pieces. Mix all ingredients and drizzle with Everything Sauce. Toss and enjoy! What a bright, vibrant dish!